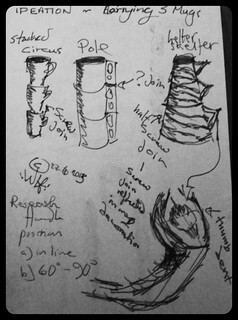 I first explored the structure – if stacking the mugs. Next I’ll explore different ways of ‘gathering’ them and container material, texture. Then, for the more successful solution options, I’ll practice more formal sketches with colour. It’s a long time since I’ve done any engineering drawing. I’m really looking forward to having a go. The multiple arm-breaks have disrupted my ability, not my enthusiasm! 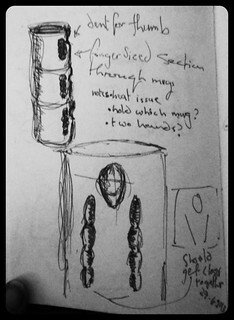 These preliminary, investigative sketches of ‘stacked’ options needed too many notes to for someone to be able to understand what I’m thinking. I want my drawings to convey the idea with minimal text explanation. This will reduce the opportunities for almost inevitable spelling and grammar errors. My original drawing kit is rusty, I feel a new drawing kit calling to me…. I love how people extend the use of designs to solve their current problems. There are no rubbish bins on this Reading town train station platform, nowhere to recycle a used coffee cup. This passenger has decided not to throw the empty cup on the floor, or carry it in his hand. The elastic properties of modern trousers afford him wedging the cup in his back pocket. 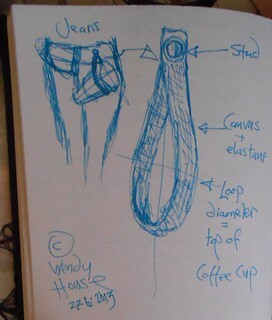 Maybe trouser waistbands already come with attachments to carry cups, like the loop in my sketch. Working on my new year’s resolution to be more creative, I spent Saturday refining a short story written last weekend. It’s my first Short story since the 1970’s when English literature coursework included the formally named ‘compositions’. As my first short story Iit wont be outstanding. It’s amazing that its even getting written! I’m using the writers and artists short story competition as a motivation, a deadline and a set of rules. The fun, the real reward, is in the process of getting the story from an idea in my head to a worthy of submission to a competition. 4) subjected the sketches to an Adobe photoshop treatment to enhance the visual impact and hide the sketch quality! 5) updated the text based on the inspirational feedback. It was so much better after the feedback. This made it clear to me how much work I need to do generally! While it could be so much better with more feedback from more people and with more time to get more detail right. For my first story, I’m ready to say I’ve learned a lot, lets move on. Producing a painting is very different from producing high quality software, it also has some key similarities. The similarities stem from the fact that you can’t do something this complicated right the first time, you need to take steps and reflect on how well each step is working, then make changes to improve it. You need to iterate. Different iterations have a different focus. Below are the iterations for my last portrait, of Jasper. The inspirational photograph is on the left hand side, the 6 iterations move from a sketch on the right to the final version next to the photograph. I planned 4 iterations and had to add one because iteration 4 (the pale one) didn’t work aswell as I’d hoped. 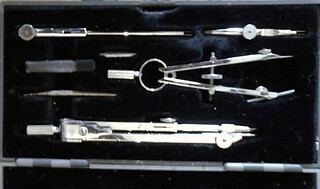 Fit and finnish: The final level details, this might be a glaze wash over the painting. For software this can be checking the details are consistent, the performance is smooth, the visuals are complete. With the wendy house blog and fireplace. Updating my banner with a stylized picture of a gravestone that sits under a Cedar tree in the Cemetry junction graveyard. 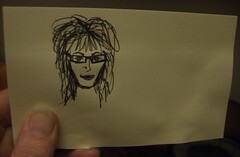 A speedy idealised self-portrait on a post-it note without the aid of a mirror has become gravatar. The hair looks like it has a little more volume than in real life. I may fiddle with impovised product for volume to capture that ’80 big hair thing in real life. Some things move on and others move around and some things get sketched on post-it notes then blogged. Tis the way of things. A poem written primarily for None-USA English speakers. Inspired by multiple miner difficulties at various stages in my enculturation to the USA such as attempting to find a quality waistcoat (vest) to wear with my tail jacket, being told I was wearing nice pants (trousers), being told I would be knocked-up (called for) in the morning and being invited to hang out (come out to play). 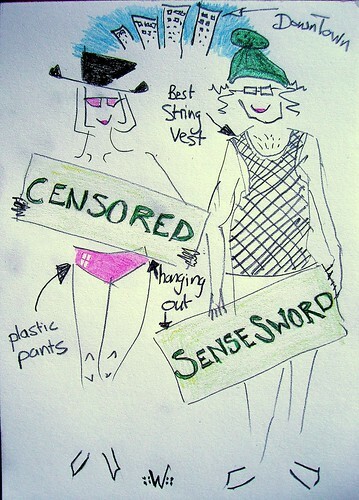 Not to mention a funnier, clever, poem about a vest by a professional poet, so I wont mention it.